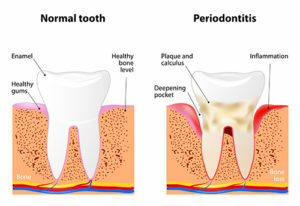 Periodontal disease (sometimes referred to as “gum disease”) is the infection of the supporting structures of the teeth. These supporting structures, known as the periodontium, include the bone and gums that anchor the tooth roots. When plaque accumulates on our teeth near our gums, the gum tissue can become inflamed, causing gingivitis. Gingivitis is a reversible process that only affects the gum tissue. However, gingivitis can lead to a more serious and destructive form of periodontal disease called periodontitis. 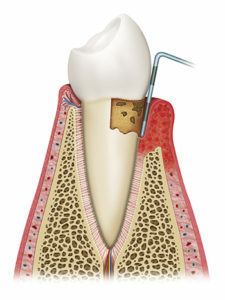 Unlike gingivitis, this disease affects the bone support of the teeth in addition to the gums. As long as the disease is caught early in the gingivitis stage, typically a regular cleaning (dental prophylaxis) would be all that is needed to treat the infection. Occasionally, a gingivitis therapy treatment would be recommended if the inflammation is severe and significant amounts of tartar are present on the teeth, requiring additional time and instruments to adequately eliminate the infection. If untreated, the periodontal disease can progress from gingivitis to periodontitis, which attacks the bone support of the teeth. Advanced stages of periodontitis can ultimately lead to tooth loss if there is not adequate bone to hold the tooth in place anymore. For most patients who have periodontitis, the disease process from healthy gums to bone loss occurred very slowly over a few years. Therefore, patients who maintain great oral hygiene and receive cleanings and checkups on a regular basis typically do not have to worry about getting periodontitis. In order to treat active periodontitis, a dental professional will be required to do more than a regular dental cleaning. Typically, the major contributing factor to periodontitis is that significant amounts of tartar (hard, calcified deposit) develop below the gum line on the patient’s teeth. Tartar can host a number of bacteria that can cause inflammation and breakdown of bone and gum tissue supporting the teeth. When this tartar is below the gum line in deep and infected pockets, it requires extensive treatment to remove the tartar and bacteria. This type of treatment is called scaling and root planing (sometimes referred to as a “deep cleaning”). Depending on the extent of the disease, it might be recommended to break up the “deep cleaning” into two appointments. After the treatment is complete, a timely re-evaluation appointment is performed to assess the healing of the gums and elimination of periodontal disease. If you think you may have Gum Disease, give your Tulsa dentist at T-Town smiles a call at (918) 488-9770 to schedule an appointment.